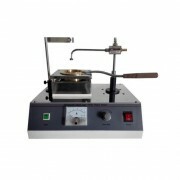 This instrument is used to determine thef viscosity of asphalt binder (bitumen) by vacuum capillary viscometers at 60°C [140°F]. It is applicable to materials having viscosities in the range from 0.0036 to over 20 000 Pa · s [0.036 to over 200 000 P]. 1. Automatically controls the temperature and vacuum degree. 3.192 * 64 dot matrix LCD, menu operation and user-friendly tips. 4. A high-precision pressure sensor and maintenance-free vacuum pump are set. 5. You can manage three groups of capillary viscometer parameters at the same time. After input the parameters, the instrument can automatically calculate the viscosity values ​​for each segment and select the valid data according to specifications. 6. It can automatically calculate the average value based on the effective data. A buit-in printer can print test results and historical data.